Synopsis: Approaching us in sovereign freedom, God comes alive to us, we come alive to God, and all creation comes alive as a sign pointing to God. In the gospel of Jesus Christ, God gives and discloses himself in this immediate way as our ultimate context and host, within the provisional medium of creation. This life-giving gospel is met by blindness, however, among those who live today in a collapsing Western culture. This is because their imaginative world is shaped by habitual assumptions and practices that lie--largely unacknowledged--deep within that culture, and that preclude openness to the gospel. Moreover, Western Christians themselves widely share these assumptions, betraying the gospel into cultural captivity. 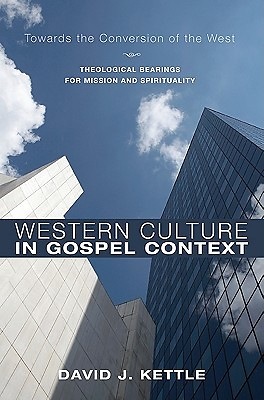 God calls for the conversion of Western culture to the living gospel. Crucially this must include, as Lesslie Newbigin recognized, a repentance from modern Western assumptions about knowledge. Part One explores seeking, knowing, and serving God, as providing a true paradigm for understanding all human enquiry, knowledge, and action. Part Two examines ten resulting "hot spots" where conversion from prevailing cultural assumptions is vital for authentic mission to Western culture. Endorsements: "David Kettle has given us an extraordinarily penetrating book. The fruit of some three decades of intense reading and thinking, his agenda is nothing less than how the Church can be part of the conversion of Western culture today. Most pointedly, he shows that the Gospel radically changes not only how we might actively engage culture but our understanding of what that culture is in the first place. The style is lucid and accessible, but Kettle is never afraid to press the tough questions and cut deep into some of our most cherished assumptions. I can't imagine anyone not being made to think at the profoundest levels by this study. I commend it most warmly." --Jeremy Begbie Thomas A. Langford Research Professor in Theology Duke Divinity School "What a gift David Kettle has given us in this masterful account of Western culture in light of the Gospel His probing analysis reveals how often our economic, political, and personal ideologies have deformed the Christian faith in ways that even believers may not have realized. The good news here is that Kettle moves beyond diagnosis to action, showing how the church might yet serve the culture as 'public host' thereby practicing God's own liberating hospitality of truth and grace." --Elizabeth Newman Professor of Theology and Ethics Baptist Theological Seminary at Richmond "This is a pioneering piece of work in missiologucal reflection, unique of its kind. Kettle aims not so much at bringing the Gospel to Western culture as bringing Western culture back to the Gospel. Mustering massive learning with penetrating insights, he takes us to different realms of Western cultural life to show how the West has deviated from the Gospel. The critique strikes home as the church is domesticated by idols and ideologies of the age. In the missiological quest for the redemption of culture, Kettle has set a great exmple." --Carver T. Yu President China Graduate School of Theology Author Biography: David Kettle (1948-2011) was Co-ordinator of The Gospel and Our Culture Network in Great Britain. He is the author of Beyond Tragic Spirituality: Victimhood and Christian Hope (2005).